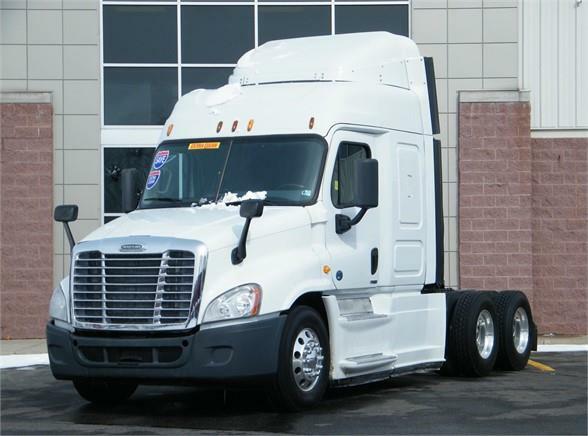 2014 Freightliner Cascadia with big DD15 505HP, 10 speed, 48" light weight mid-roof sleeper, heated power mirrors, dual 100 gallon fuel tanks, air slide fifth wheel. Excellent brakes with very good tires wrapped around polished aluminum wheels. This is a high HP light weight truck that is an excellent choice for flat bedders, tankers, regional haulers and more. This will come with the SelecTruck 60 day Buyers Assurance policy-Turbo-DPF-Clutch-Air compressor, AC, Alternator, Starter to name a few items plus a FREE 1yr/100K mile Freightliner factory warranty on the engine, transmission and rear diffs.